Everyone knows who Rihanna is. We agree that Rihanna is not only a talented singer, but also a trendsetter. She becomes a center of fashion and we can’t stop following what she wears and what she does. Besides clothing, Rihanna’s hairstyle becomes a ‘guidance’ for women to follow. Her short hair is so chic, edgy and fabulous and it becomes so popular. All women want to cut their hair, just like Rihanna. We believe you want too! Here we offer you pics of best Rihanna’s short hairstyle you can opt for. Pixie cut is one of the famous short hairstyle which celebrity has applied, including Rihanna. She chooses some kinds of pixie cuts which are amazing. She is the best when having a short pixie cut, layered crop, side-swept pixie, and pixie cut with soft waves. Her short pixie cut shows how stunning she is because the hair is cut in short layers. It will fit for a person who has a heart-shaped and oval face. This cut will give you a light, fun and warm look. Meanwhile, layered crop and side-swept pixie will rock your hair if you add more layers to your side bangs and more volume. Pixie cut with soft waves will make you look cute and edgy at the same time. The glossy waves make this hairstyle glamorous and trendy. You don’t have to be afraid to use pixie cuts because you’ll look younger with these hairstyles. Rihanna’s messy and sleeky blunt bob will also be good options for every shape, including round face. The hair is cropped at the length of the neck which gives you a not-too-short hair. The messy hair gives a fun and edgy look, while the sleeky one gives an elegant and stunning look. This hairstyle will not disappoint you. You can also choose blunt angular bob as your hairstyle. This bob will fit you no matter what kind of hair and kind of face you have. This cut makes you more alive and sexier! Besides bobs, Rihanna also looks perfect with her fork and bowed out bangs. These haircuts will fit those who want to look edgy and bold. 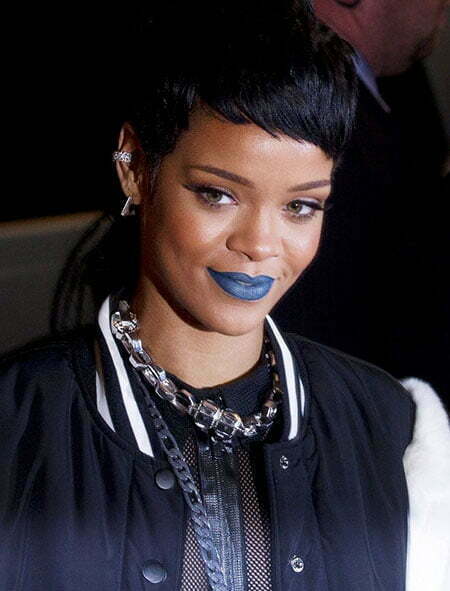 You will also look gorgeous when you use Rihanna’s fauxhawks and pompadour Mohawk. The hair is shaven at sides and voluminous at the top. If you want to be bolder, give more volume at the top of your hair. The difference between fauxhawks and pompadour Mohawk is that fauxhawks gives a sharp cut at the back of your hair, while pompadour Mohawk gives a wave cut at the top. Besides these hairstyles, you can also choose two-toned short bob, long bangs bun, knotty knots, tangy curly, side shaved bob, fringed bob, and curly bob as your options. Look at these haircuts below and see how stunning Rihanna is with short hairstyles. As you can see, we have offered you choices of Rihanna’s short hairstyle. These haircuts are unique and you can try any of them. Rihanna’s hairstyle will never be disappointing, so feel free to enjoy them and stand out in every occasion.